Supporting urban agriculture such as through community gardens and orchards. 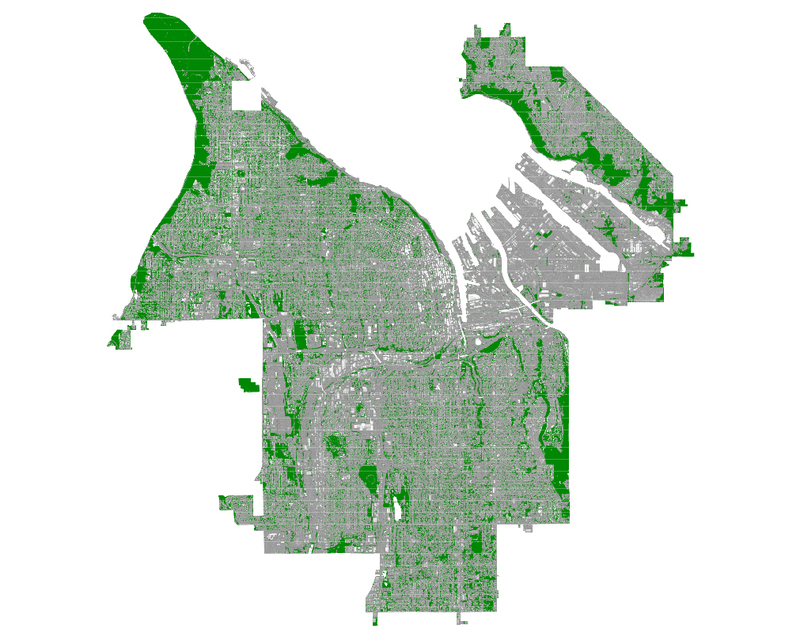 In the summer of 2011, the University of Washington's Remote Sensing & Geospatial Analysis Laboratory completed an analysis of 2009 data (aerial photos and LIDAR), with funding support provided by the Washington's Department of Natural Resources Urban and Community Forestry Program, to provide Tacoma with an updated approximation of our tree canopy cover. Obviously there are parts of Tacoma that can grow more trees and there are parts that can grow less due to development. In order to break the city-wide goal down into more manageable goals, we completed further analysis. Using the data from above and Tacoma's existing zoning and current land uses, we've devised the following goals for canopy cover by land use. In order to assist us with achieving our goals, particularly in our Neighborhood Business Districts (NBD) which were identified as priority planting areas by the Urban Forest Policy Element, we further analyzed our canopy cover data to give us approximations of the canopy cover in each NBD to determine what amount of growth is needed in each district. The table below shows canopy cover by NBD in both actual and needed cover for the entire NBD and for the rights-of-way (ROW) within each Neighborhood Business District. You may also be interested in our Strategic Urban Forest Management Plan (SUFMP) for Neighborhood Business Districts. How can you help? Help us grow, get involved.